Home / Brexit / EU / Poland / Brexit to the West and Polexit to the East? Brexit to the West and Polexit to the East? There is not much the EU could have done to keep the UK in its club. Former Prime Minister Cameron sought some concessions, but the importance assigned to immigration and regaining sovereignty by the Brexit camp and British media meant that there was no politically realistic concession that the EU could have made to appease those favoring to leave the EU. Much of the UK's frustrations grow out of the success of its own strategy. It sought a broad union instead of a deepening union. The broadening of the union means that overtime, decisions could not be made on the basis of unanimity. That simply was not an efficient governing principle as the bloc got bigger. Nor could the EU do anything about the terms of the referendum. It was offered as a non-binding resolution. There was bait-and-switch. Cameron made the referendum binding, and although May deviated from several of his initiatives, she could not bring herself (or the country) to re-think the results of the referendum. The EU (and others) can rightly be surprised that the UK would make such a momentous decision on the basis of such a narrow vote. Indeed, 18-months on from the referendum, some polls show the "Remain" camp has moved into the lead. This is understandable, as the "Brexit" camp oversold the benefits and minimized the costs, which are becoming clearer as the divorce talks proceed. Brexit changes the balance of power in the EU. The UK gave voice to those members of the EU that were not members of EMU. It often articulated the interests of those who chafed under what was perceived as a growing super-state of largely unelected EU Commissioners based in Brussels. The EU's challenge in eastern and central Europe is not caused by Brexit, but the UK's exit exacerbates it. At issue is the adherence to EU rules and the price of non-compliance. Immigration is a particularly divisive issue in the EU. It seems to be among the most important issues in the Brexit drive. It appears to have been a critical issue in other European elections, including Austria and the Netherlands this year. It also was a salient issue in last year's US election. The EU has sued Poland, Czech, and Hungary for refusing to accept "their share" of asylum seekers. In 2015, the EU agreed to accept 160k asylum seekers and relocate them throughout Europe. Five countries in eastern and central Europe voted against the measure. Since then the Czech Republic has accepted 12 of 2000 it was assigned, and Poland and Hungary have accepted none. The EU has a separate case against Hungary. Prime Minister Orban has singled out Soros and is seeking to close a university he founded and is tightening the rules of foreign universities. The EU argues Hungary is violating the EU laws and values. However, the EU's effort to force conformity is focused on Poland this week. The EU objects to laws passed by Poland's legislature that will force about 40% of its judges to retire. This is seen as violating the independence of the judiciary by putting it under political control. The EU is expected to deliver an unprecedented warning to Poland on December 20. With Germany and France supporting the warning, the necessary 4/5 majority vote is likely. Under Article 7.1 of the Maastricht Treaty, Poland will be given a few weeks to react to avoid further sanctions. This sets up a more dramatic confrontation early next year. It could ultimately face a suspension of its voting rights. However, this requires a unanimous vote and Hungary has indicated that it would veto such a sanction. Still, the EU wields the power of the purse, and this could be persuasive than its moral suasion. Poland is the largest net recipient of EU funds, which might be worth one percentage point of growth. 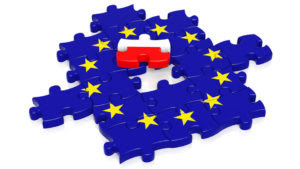 Adjusted for inflation, by 2021, Poland will receive more on a gross basis from the EU than the aid provided to Europe under the Marshall Plan. The tragedy is that the EU had been a hallmark of democracy, liberalism, and modernity and was seen as such by eastern and central European countries both during the Soviet era and afterward. Those values have become suspect in a wide swath of eastern and central Europe. The Visgrad Group (Poland, Hungary, Czech, and Slovakia) pose a different kind of challenge to the EU than Brexit, but it is just as serious. Ironically, the UK would find the Visgrad Group an important ally on numerous issues if it were to have remained in the EU. Some in western Europe, with thoughts of a stronger more unified union, may, as Schulz, the head of the German SPD, and former head of the EU Parliament, suggested, welcome those who do not share the core EU values and vision to simply leave. A core Europe would then be more likely to deepen their integration, though the German CDU/CSU are not supportive of a United States of Europe.